Dale Pond's recent book detailing Professor Daniel Brinton's abstract on Keely's work containing revelation of 3, 6 & 9. Keely's endorsement of Brinton's interpretation of his work shows how important it is. You can see scans of the original letter here. The enclosed abstract relative to my researches (written by yourself) is perfectly correct in every particular and shows that your mind as directed in the direction of analyzing the system of vibratory philosophy in its physical relations to the universe of matter is purely and sympathetically concordant with my own and indeed you are the first one I have ever met who have had the proper conceptions in regard to my researches. By the express desire of Mrs. Bloomfield-Moore I send this to you to forward to her at your earliest convenience. 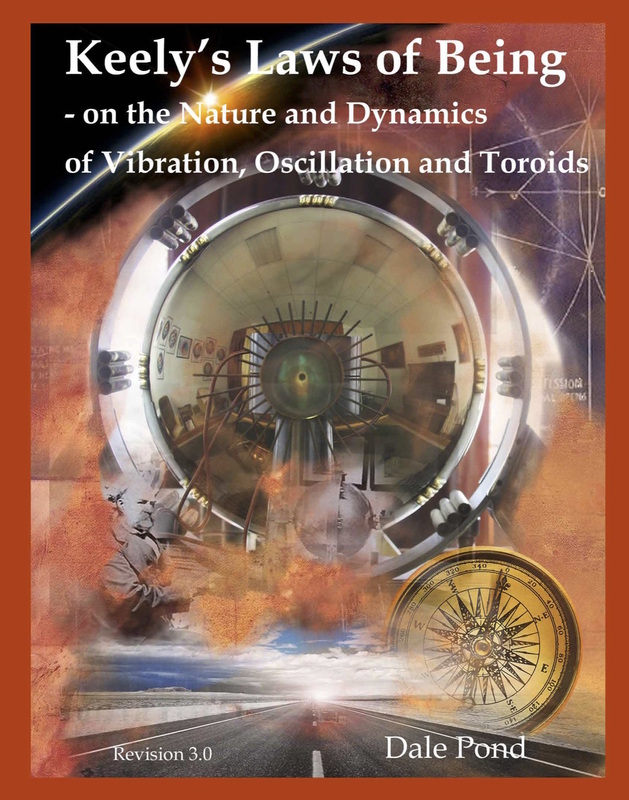 Keely's Laws of Being - The Nature and Dynamics of Vibration, Oscillation and Toroids by Dale Pond. Version 3.0 is finally complete! There will be no further updates on this book unless minor typo fixes. I've worked very hard updating this material since the last version. The chapters have been reorganized, most material rewritten, rearranged and added chapters, added new images, bibliography and index. Total page count 338 pages. I feel I have done my duty with this update. It is a great book! If you have purchased an earlier edition email me for a special price on this edition. 338 pages, 8 1/2" X 11", Perfect Bound. 5) what these subtler polar forces are. 8) all individuals are connected through laws and principles. This awareness, about the hitherto ignored inner nature of vibration, motion and power, can and will cause a massive yet positive shift in all branches of science, engineering and society as a whole. I received my inscribed copy of Keely’s Laws of Being. Thank you kindly for the inscription, it is special to me. You have produced a terrific leap from revision to revision, hats off to you in this final one! Your hard work, diligence, care, unique insights and loving attention is reflected in this very fine work. "Your latest book, Keely's Laws of Being, is a joy for me to read. Like Jerry states, it is coherent. I find it logical, enlightened and enlightening. You have done a fantastic job of explaining physical phenomenon in terms of Keely and Russell, especially in terms of the sympathetic nature of Love. Those are ideas that I can hold in my consciousness during my daily activities. The act of observing and being aware of the sympathetic connection heightens and magnifies my experience of the joy, happiness and love in which we have our being." C.
"There are times in life when all the stars seem to align for us. This work, for Dale Pond, is one of those moments! Dale has worked to recapture John Keely's fragmented work for over three decades and collate this collection of fragmented footnotes back into John Keely's coherent science called Sympathetic Vibratory Physics. I have known Dale personally for twelve years and studied along side him the works of John Keely. It took me many years to understand in a coherent manner what John Keely was saying. A lot of this confusion was due to his works being so fragmented. Dale has completed and is still working on his SVPwiki.com, which integrates so many others' works that support the threads of John Keely. Still one must be deeply committed to the study to pick up the basic corollary concepts to develop a clear image of this new science discipline. "Well, no longer! This new publication of Dale Pond is surely his greatest work and most fundamental. Here he has laid out a basic building block of Sympathetic Vibratory Physics in a sequential coherent pattern that helps the reader circumvent years of study to reveal an understanding of this science. "John Keely was a thousand years ahead of today's quantum physicist understanding of the basic building blocks of the Universe. John Keely saw it as a three dimensional construct of radially vibrating energy systems from centers in proportional progressive values filling all the plenum of Universe. He understood through repeatable experimentation the character of this primal energy construct and how to manipulate it's present stable resonate fundamental states - a known matter into new ones - yet undiscovered by modern man. Also, along the way he discovered many wonderful, what would seem magical characteristics of these new states of matter and force. Dale Pond talking about the book.